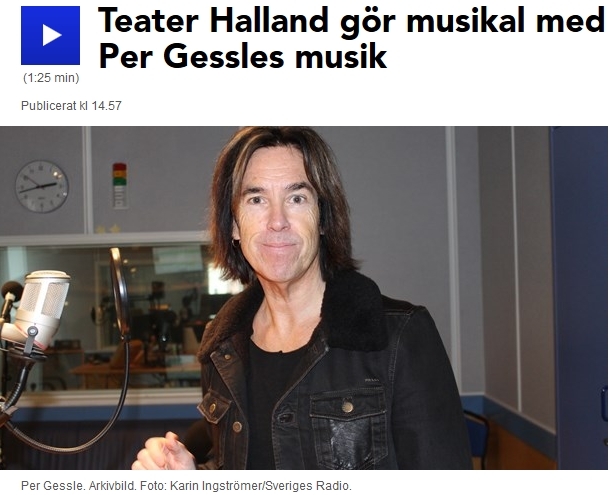 Teater Halland got green light from Per Gessle to use his music in their upcoming musical “Halland Love Stories”. The approximately 2-hour-long (plus break) musical’s premiere is set to 2nd March 2018 on the Main Stage of Teater Halland in Varberg and then they will tour with it in other theaters of Halland and neighbouring regions in Sweden. There will be 4 actors in the musical. The theater plans to ask the audience, those living in Halland to tell them their own love stories and from this collection, to Mr. G’s songs they will create a musical which will be a celebration of love. According to the theater’s director, Anna Sjövall, Per thought it sounded like a very funny and nice idea. The musical will consist of Per’s Swedish songs and it will be a bit like Mamma Mia! “På promenad genom stan” or “För bra för att vara sant” are very much home for me. There are several songs on my new album (out in April), which also belong to Halmstad. Small town genes never disappear. No, but I’m still young. SVT asked Per what songs he listened to more than once this year so far. Per says Linnea Henriksson’s new song “Säga mig” is very good. Bon Iver’s latest album is wonderfully weird. Mr. G says that after his trip to Nashville he ended up in an old-fashioned country-coma. Kris Kristofferson and Willie Nelson and such. Adorable. Alex Shields’ “New York City Ways” has been hot in the kitchen since Christmas, but he is biased there, as he was involved in writing it.